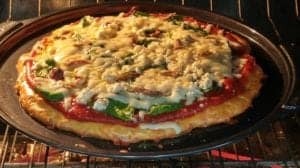 Most have made “fathead pizza” — with it’s decadent cheese-rich crust and have tried their hand at it’s more virtuous cousin, “cauliflower pizza”, yet still wish there was such a thing as an authentic yeast-raised crust made with low carb-friendly ‘flour’. Now there is! Don’t get me wrong. 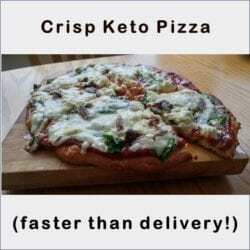 I really enjoy Crisp Keto Pizza, which is my yeasty adaptation of the familiar fathead dough, but I really find dough made from cheese just too rich. 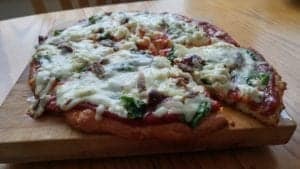 My Crispy Cauliflower Pizza is also very good, but I longed for regular pizza crust made from a low-carb friendly ‘flour’ that had a wonderful yeasty smell as it’s rising and baking and that had the taste and texture of real pizza. This is real yeast-raised thin-crust pizza with the taste and texture I’d been missing! Place the lukewarm water in a Pyrex measuring cup, add the little bit of sugar and sprinkle the yeast on top and let it ‘proof’ (multiply and foam) for 10 minutes. 3. 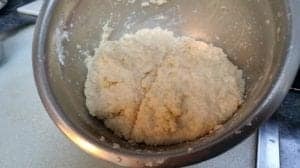 In the bowl of a food processor, add the almond flour, powdered psyllium powder, baking powder and salt and pulse until well mixed. 4. 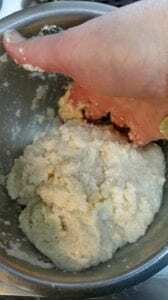 Add the egg whites and then add the foamed yeast mixture and pulse the food processor until the dough begins to come together, then pulse the food processor a few more times until it forms a ball on the blade. 5. Remove the dough from the food processor and then knead it a few times until it forms a smooth ball. Place the dough on a clean work surface, cover it with a cotton tea towel and let it rest and rise for 15-20 minutes minutes before beginning to make the pizza. It should look slightly puffy and risen. 6. Preheat a stick proof skillet to a medium-high heat and cut the ball of dough in half and then each half in 1/4 so that there are eight sections. 7. Roll each section into a 1” ball. 8. Lining a tortilla press with a piece of heavy plastic**, place one of the 1″ balls (it will continue to rise, so may be slightly larger at this point!) in the press and press well until it is about 5″ round, but not too thin. 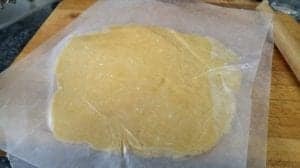 **If you don’t have a tortilla press, it can be rolled out between sheets of heavy plastic or parchment paper until each piece of dough is 5-inches in diameter. 9. Immediately transfer the pressed dough onto the preheated non-stick skillet and bake for ~2-3 minutes then flip it over using a spatula and cook until “just” cooked (maybe another 10-15 seconds, maximum. 10. Set aside each of the pre-baked pizza crusts on a cooling rack. 11. Preheat oven to 400 degrees F. Have the top rack of the oven in the middle (not too close to the broiler element). 12. Dress and assemble your pizza to taste. I used homemade pizza sauce, grated mozzarella cheese, sliced turkey pepperoni and anchovy fillets (yes, I like them!) but toppings can be according to your imagination and what you have on hand. 13. When all the pizzas are assembled, change the setting on the stove to “broil” and place the two baking pans with the dressed pizzas in the oven and allow to broil until bubbly. Keep an eye on them because they can go from perfect to burnt in no time. 14. Remove the baking pans and place on cooling racks for a few minutes, then serve. * if you need a much lower carb crust, please do check out my Crisp Keto Pizza and Crisp Cauliflower Crust. They are both very good. 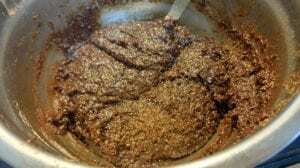 *Place 1/4 cup of whole psyllium husk in a clean, dry coffee grinder and pulse several times until it’s a fine powder. 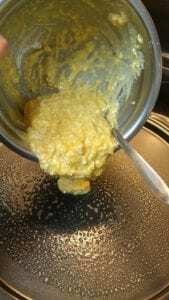 In the bowl of a food processor, add the almond flour, coconut flour, xanthan gum, powdered psyllium husk, baking powder and salt and pulse until well mixed. Add the egg, apple cider vinegar and water and pulse the food processor until the dough forms a mass, then pulse the food processor a few more times until it forms a ball on the blade. 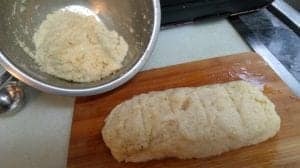 Remove the dough from the food processor and then knead it as you would regular masa harina dough (the corn flour dough used to make regular corn tortillas) until it forms a smooth ball. Place the dough in a clean plastic bag and let it rest for a full 15 minutes before beginning to make tortillas. 6. Cut the ball of dough in half and then each half in 1/4 so that there are eight 1” balls. Lining a tortilla press with a piece of heavy plastic**, place one of the 1″ balls in the press and press well until it is the thickness of a standard corn tortilla. Be careful not to press it too thin or it will break when you try to get it off the plastic). If you don’t have a tortilla press, it can be rolled out between sheets of heavy plastic* until each is 5-inches in diameter. 7. Immediately transfer the pressed dough onto the preheated non-stick skillet and bake for 20 – 30 seconds (it will have the characteristic char marks!) then flip it over using a spatula and cook until “just” cooked (maybe another 10-15 seconds, maximum. It is very important not to overcook these or they will not be pliable and will crack when folded. Place on a baking rack for a few minutes to cool, if saving for later or keep them warm wrapped in kitchen cloth until serving. Can be wrapped in a heavy duty zipper plastic bag and refrigerated or frozen for future use. What would Thanksgiving be without pumpkin pie? 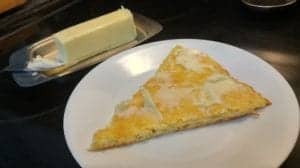 This recipe is so delicious that you don’t really need the crust, but if you insist my flaky all-butter crust posted here would be just perfect! If you would like to know how I can help you follow a low-carb or ketogenic lifestyle, please send me a note using the “Contact Me” form above. I provide both in-person services as well as appointments via Distance Consultation (telephone / Skype) so feel free to let me know if I can help. This recipe began as the result of a recipe that someone posted on Facebook for Keto Blueberry Scones. Since had raspberries in the house, I mentioned that I would use those instead when the person who posted the recipe suggested I add stevia-sweetened chocolate chips. Since chocolate-raspberry is one of those epic combinations but not liking stevia-sweetened anything (I find the aftertaste terrible!) I decided to chop up a piece of a 95% dark chocolate bar into small chocolate chips, and use those. Perfection! * Note: cream in different parts of the world is called by different names. This table should help. Preheat oven to 375° F and line a baking sheet with a piece of parchment paper. Mix all the dry ingredients together in a medium size bowl. Mix all the wet ingredients in a small bowl. Add chocolate chunks and raspberry pieces and fold them in gently (don’t over mix). Pat into a flat disk con the parchment paper. Cut into 6 pieces with a large knife or a pizza cutter. Bake at 375º for 18 minutes then remove from the oven and gently move the pieces apart from one another and return to oven until lightly golden in colour. Don’t over bake! 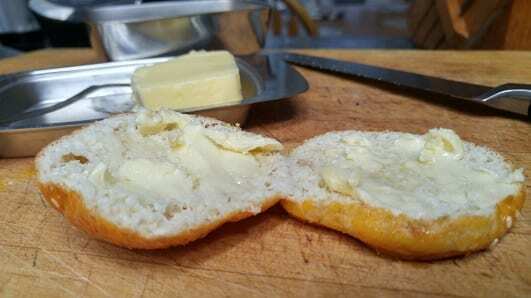 Enjoy topped with a little fresh unsalted butter! Last March, I made “zoodles” for the first time. I thought it was ingenious to use shredded zucchini in place of noodles – not realizing that people long before me had thought of the idea! 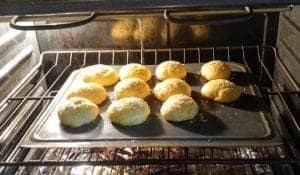 I posted my recipe here, but have since tried to perfect them, to keep them from ending up sitting in a puddle of water. Someone online mentioned baking the shreds first, immediately after making them. While they oozed less water when served, they were limp. Quite disappointing! Yesterday, I was craving spaghetti and Bolognese sauce and had some beautiful pastured beef to make it with and fresh oregano that was still surviving in my garden so I decided to see if I could solve the “water problem” of zoodles, without affected the texture. I did it! I had both yellow and green zucchini in the house (2 of each) and decided in the interest of colour, to use the yellow ones. Here’s the technique for perfect zoodles! Shred the zucchini lengthwise on a mandolin down to the core on each side (but not including the too-soft core). Lightly salt the shreds and then toss well and let them sit a few minutes to let it start to draw out the water. Microwave the zoodles for 3 minutes on high, covered with a microwave cover. Dump into a mesh colander (the kind for sifting flour). Allow to cool just long enough to handle them (don’t rinse with water to cool them, as they will absorb it readily) then gently squeeze out all the water in cupped hands (as one would do with frozen spinach when preparing it for a recipe). Top with your favourite spaghetti sauce, serve and enjoy! These were amazing!! No pooled water! …and they twisted just like pasta! Last weekend I felt like something yummy; something like popcorn with butter and salt or fresh corn tortilla chips. As a Type 2 Diabetic in partial remission I’ve worked to long to get healthy and either of those wouldn’t have been helpful for me to eat. I grabbed some raw almonds, drizzled them with some almond oil (but any good quality nut or seed oil would have done) and tossed them all around until they were well coated and shiny and placed them on a double layer of aluminum foil. I preheated the oven to 350°F and then topped them with a healthy amount of freshly-ground sea salt and roasted them for 15 minutes until they were slightly golden and smelled aromatic. When I pulled them out of the over, I bathed them liberally with Tajin Seasoning® – a Mexican spice mixture of mild chili pepper and dehydrated lime juice (available at most supermarkets that carry international foods). I’ve enjoyed these so much, I thought others would too. Remove from oven and when still hot, top with desired amount of Tajin Seasoning®. 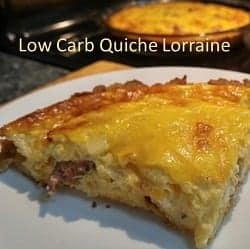 If you’ve had a look through some of the recipes posted on this website you know that while they’re all “low carb” there are some that are high fat and others that are moderately-high fat. That’s because people’s individual needs in following a low carb diet are different. There isn’t a “one-size-fits-all” low carb or ketogenic (keto) diet. Some people have higher protein needs while others have medical conditions that necessitate a therapeutic ketogenic diet (which is very high in fat and minimal carbohydrate). As well, for those seeking weight loss, those who have 15 or 20 pounds to lose won’t necessarily eat the same way starting out as those with a great deal of weight to lose. Often, those with lots of weight to lose will eat differently at the beginning of their weight-loss journey than they do when they reach plateaus, and as they do towards the end of their weight loss because their body adapts and changes. As a result, these folks need to have their Meal Plan adjusted over time whereas someone with a smaller amount of weight to lose may do fine with the same Meal Plan all the way through. Everybody’s different. If you’ve been following this blog for a while, you know that I’ve lost almost 40 pounds in just over a year eating this way and put my Type 2 Diabetes into remission while reversing my high cholesterol and high blood pressure. You can read my own story under “A Dietitian’s Journey” under the Food for Thought tab. Since I was Diabetic for 10 years and obese for much longer than that, I tend to limit my own intake of low carb baked goods (muffins, pancakes and breads) made from ground nuts or seeds and cheese as these are very energy dense. I still have some of my own excess fat stores to lose as well as continuing to lose fat from places it should never have been in the first place (including very likely my liver) so eating extra dietary fat outside of what is found naturally in whole, unprocessed foods (meat, fish, poultry, cheese, egg) doesn’t make much sense. Below are a few of my most popular recipes grouped by type of low carb diet. Please remember, not all recipes will be suitable for your specific health conditions or weight loss goals, so if in doubt please check with your Dietitian or physician. For those that follow a high fat style, below are a few of my most popular recipes. For me and quite a few of my clients who are in the weight loss phase, these are “sometimes foods” and not “everyday foods”. This Low Carb Chocolate Chip Pancake recipe was recently posted but I’m pretty sure it will become a favourite, too. If you have questions about how I can help you to lose weight, reverse Type 2 Diabetes, high blood pressure or high cholesterol or to adopt a low-carb lifestyle for its health benefits, please feel free to send me a note using the Contact Me form on this web page. I provide both in-person services in my Coquitlam (British Columbia) office, as well as services via Distance Consultation (phone or Skype) to those living elsewhere. 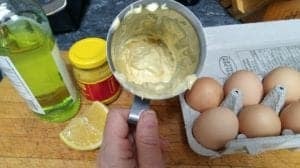 I’ve tried a few of the keto pancake recipes online in the search for one of my sons that adores pancakes and found they either fell apart when cooking or were gritty because they contained psyillium husk or coconut flour. Undeterred, I invented my own this morning. These are light and fluffy, turn over intact (provided you don’t try and do it too soon!) and have the texture of real pancakes! 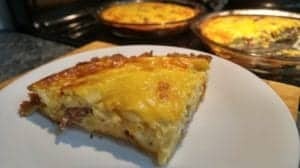 Perfect for an easy-to-make breakfast or serve as part of the popular “breakfast for dinner”, along with a side of eggs, sausage and sauteed zucchini or other veggie. Maybe it’s just me, but I resent the ridiculous price charged for specialized unsweetened “keto” chocolate chips ($8 for a tiny bag!) so this morning I took 4 squares of an 85% dark chocolate bar (15 g of carbs) and cut it diagonally in opposing directions and made the perfect size mini chocolate chunks to put in my batter. In minutes I made the loveliest, light and fluffy pancakes and served them to one of my sons along with a side of eggs (and even ate two mini pancakes myself and I’m not a ‘breakfast person’). The recipe and nutritional information is below. Since I eat this way myself (and have for over 17 months! ), I create recipes for myself and for my family that are so close to the originals that we really don’t miss the carb-laden ones and don’t feel deprived and I share some of my favourite recipes here on my website so that others can enjoy eating this way, too. If you have questions about how I can help you either in-person of via Distance Consultation, please feel free to check out my services by clicking on the tab above, or send me a note using the Contact Me form on this web page. In a medium sized bowl, put the almond flower, baking powder, xanthum gum, Swerve® and salt. In a smaller bowl, beat the eggs, add the pseudo-milk and real vanilla extract (or fresh vanilla bean seeds), mix well. preheat a non-stick skillet to medium hot and while heating, mix the wet ingredients and fold into the dry ingredients. Toss chocolate chunks into batter and stir well. lift off cover and when the edges of the pancakes loose their wet look, flip each of them over and recover the pan for allow the pancakes to finish cooking. I’d heard of cauliflower crust pizza but had also heard that it gets notoriously soggy shortly after coming out of the oven. 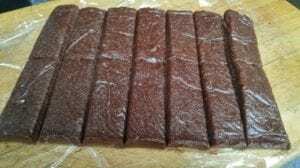 Recently, a few people were remarking how much they like the taste but wish there was something that could be done about the texture – which I took it as a challenge. 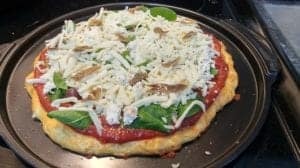 With a little thought and a fair amount of experience, I created a light, crisp cauliflower pizza crust that is a lovely change from “fathead-style” pizzas. 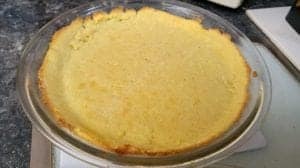 I started with a few basic cauliflower recipes and took the best of each and then added low-carb ingredients that would both improve the nutrient profile and solve the texture issue. Boom! Done. For those looking for a crisp and light cauliflower pizza crust, the recipe is below. Note: I had a hard time deciding between the crisp cauliflower crust and the Crisp Keto Pizza that I created last winter. You may need to do as I did last week and make both, to decide. wash the cauliflower, break into flowerettes and pulse in a food processor or industrial blender until a fine powder (like rice). place ‘riced’ cauliflower in a microwave-safe bowl, cover and microwave for 3 minutes on high, then let sit for 3 minutes. transfer cooked cauliflower to a clean, linen tea-towel and allow to cool. once the cauliflower is cooled, gather up the tea-towel and wring out as much of the water as possible, being careful not to mash the cauliflower (only wring the water out). place the wrung out cauliflower in a non-metallic bowl, with the beaten egg, salt, Parmesan, mozzarella, whey protein powder and baking powder and mix by hand until well combined. if using immediately, add the tomato sauce and mozzarella cheese (and any additional toppings of your choice) and bake for 10 minutes more, until the cheese is nicely melted and bubbly. Enjoy! These bars are my absolute favourite! With the taste of a Terry’s Chocolate Orange® but the moist, chewy texture of a brownie, the challenge is eating just ONE! Really! Each one has only 6- 1/2 g net carbs and 34 g of protein per bar and have almost 21 g of healthy fats and are great as a meal replacement on your Meal Plan, but remember; one serving is one bar. Seriously, they are that good! These use clarified butter (ghee) and tahini (ground sesame paste) and I recommend using peppermint orange extract and the freshest 100% tahini sesame butter (no added soybeans oil). P.S. If you have questions about the types of in-person and Distance Consultation services that I provide, please send me a note using the “Contact Me” form on this web page. 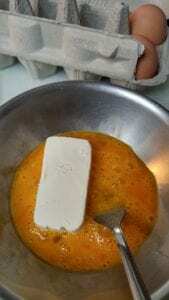 Melt the ghee over a low heat, until just barely melted. Put the tahini (sesame butter) in a deep bowl and slowly stir in the melted ghee. 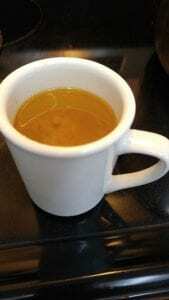 Gradually stir in the water, stirring very well until completely blended and smooth, then add the orange extract. Pour the sesame butter (tahini), ghee and water mixture into the dry ingredients and mix well with a large spoon, until it forms a firm dough. Gather the ball together with your hands and knead as you would for a bread dough, to make sure all the dry ingredients are uniformly moist. 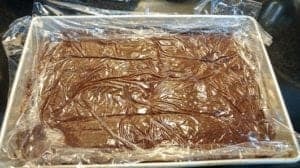 Grease a 7 ½ x 11-inch baking pan (or line with plastic wrap) and gently press the dough into pan and place another sheet of plastic wrap on top). Take a small, empty glass jar (or drinking glass) and use it like a rolling pin, to make the dough is flat. Cover well with a plastic bag and chill in the refrigerator for at least 6 hours, or overnight. When ready to serve, cut down the middle lengthwise and then across into 6 even pieces. Makes 12 bars. 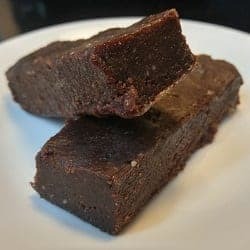 These low carb chocolate mint protein bars are moist and fudgey and seem way too decadent to be as healthy as they are. 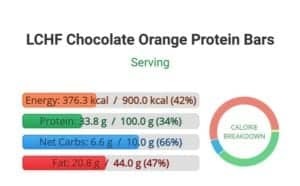 Compared to other low carb chocolate mint bars available on the market which have less than 10 g of protein each, these boast a whopping 34 g of protein per bar, have 16 g of healthy fats and are just a touch over 4 g of net carbs each! 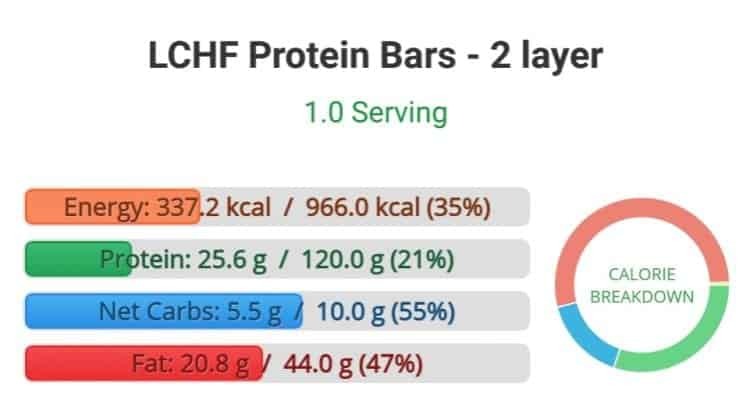 With macros like this, these bars are great to grab as a meal replacement on your Meal Plan. These also travel very well in a lockable containers so they can go with you to the office, to the gym or tucked in a backpack …that is, if they don’t all get eaten first! 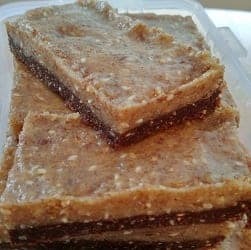 I’m not generally one to think of things in terms of “dessert” but these bars could easily make a super-healthy no-bake brownie, with 1/2 cup of chopped walnuts added and cut in squares! For those who’d prefer a slightly firmer texture bar (similar to the two layer protein bars I posted previously), simply add an extra 2 Tbsp. 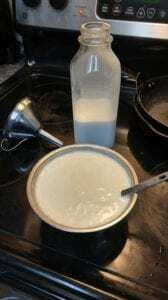 of coconut flour where indicated in the recipe, below. 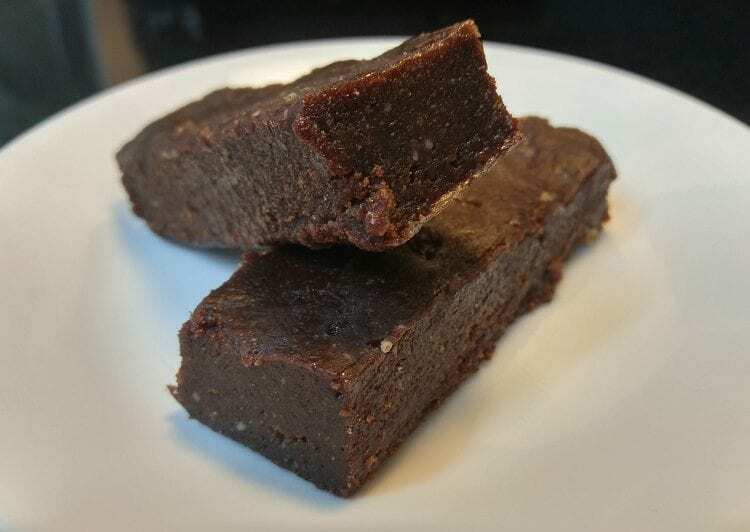 One the suggestions of someone on social media gave me after I created the two-layer protein bars was to use butter in place of coconut oil for the fat profile. These use clarified butter (ghee) and the taste is amazing! As always, I recommend using genuine flavouring; including natural vanilla extract and pure peppermint / mint extract and 100% almond butter (no added soybeans oil). I do hope you enjoy these as much as I do! Put the almond butter in a deep bowl and slowly stir in the melted ghee. Gradually stir in the water, stirring very well until completely blended and smooth, then add the vanilla extract and mint extract. 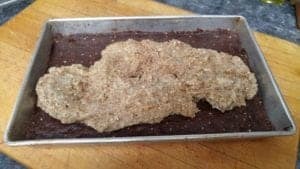 If making a firmer bar with added coconut flour, gather the ball together with your hands and knead as you would for a bread dough, to make sure all the dry ingredients are uniformly moist. With less coconut flour, simply stir very well, making sure there is no remaining unmixed ingredients at the bottom of the bowl. Let’s face it, there are some foods that are really hard to find convincing alternatives to when following a low carb or ketogenic (keto) lifestyle and two of these are pizza and noodles. When it came to pizza, we all know “fat head pizza”, but when I wanted a legit, yeasty pizza dough crust, I created Crisp Keto Pizza. Noodles are another one of those foods, and while back in my early LCHF days I came up with Zoodles (Zucchini noodles), I later found out that there were others who thought of it before I did. While it still amazes me how much Zoodles taste and even behave like ‘real’ pasta (can be twirled on a fork, for example) the Low Carb Broad Noodles that I created yesterday were a stroke of desperate, creative genius. 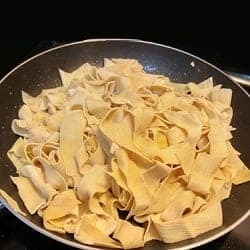 I wanted something that I could butter and that would fry up like really noodles and to be honest, these are almost better than the original because there is no over-stuffed carb hangover! Best yet, they have just 1 g of carbs and 7 g of protein per ounce. Okay, so what’s not to love? Some of my friends that follow a low carb lifestyle insist that there are certain foods that are “off limits” with soy being one of them, so to these folks I apologize. For the rest of you, these Broad Noodles have all the texture and mouth feel we want in a noodle! So what are they made of? 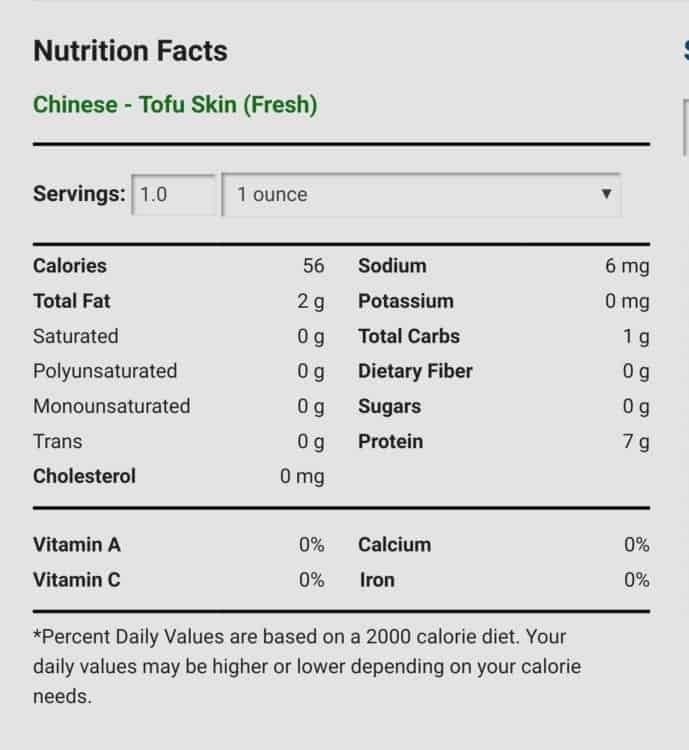 Tofu skin. That’s right, tofu skin. This is the thin film that forms on the top when tofu is being made (which is very similar to the ‘skin’ that forms on old-fashioned cooked puddings of yesteryear). Most large Chinese supermarkets sell these in packages fresh and smaller ones often have them frozen but if you’re lucky enough to live in a town or city with a “tofu factory” then you can buy these sheets in bags for remarkably little money. To make these sheets of Tofu Skin into “noodles”, all I did was unfold the large sheets and then folded them in half one way (mine were square) and then I rolled them up like one would roll a jelly roll. Then I cut them into the width of strips I wanted. Finally, I dropped them into boiling salted water for 2 minutes (or until the texture was what I was looking for) then drained them, salted them liberally with sea salt and voila, noodles! Good? No amazing! I fried mine in butter and served them with some homemade beef stew and everyone’s noodles completely disappeared before more than a dent was made in the stew. 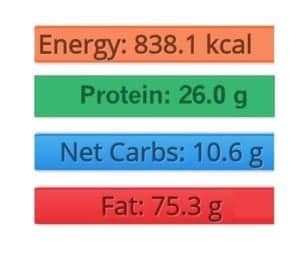 Below is the Nutritional Information per ounce and as you can see, they are extremely low in carbs and fat and very high in protein. While you’re here, feel free to look around my web site, perhaps read some of the “Science Made Simple” articles or have a look at “A Dietitian’s Journey” which is my personal story of following a low carb / keto lifestyle the past 11 months. If you have questions about the services that I provide via Distance Consultation or in-person in my Vancouver area office, please send me a note using the ‘Contact Me’ form. 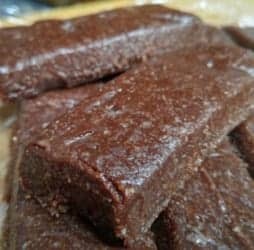 Most people who follow a low carb or ketogenic (keto) lifestyle find themselves in those situations where they need a quick ‘something’ that functions as a meal, and while grabbing one of those commercially prepared packages is tempting, quick and easy protein bars created in minutes at home are so much better! 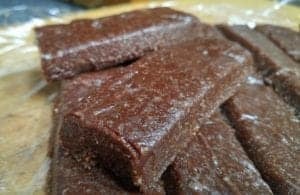 These Low Carb High Fat (Keto) Protein Bars were created with one of my young adult sons in mind, as he has already achieved his ideal weight and waist circumference eating a low carb, ketogenic diet, and sometimes hasn’t got time for lunch. His job is very physically demanding, so having an adequate source of protein and fat, with minimal carbohydrates is essential. They are also super easy to make, that even someone who doesn’t bake can make these as there is no baking involved! I designed these yesterday afternoon and after dinner, at my son’s urging, we tried one (actually I tasted a piece of one and he ate the rest of mine and his, even though we had just finished a delicious dinner of BBQ’d fish and salad). They were that good! What is especially lovely about these bars is they aren’t too sweet with no stevia aftertaste! These bars pack a nutrition punch and don’t cost the exorbitant amount commercially available ones do (often costing $5 – $6 each). 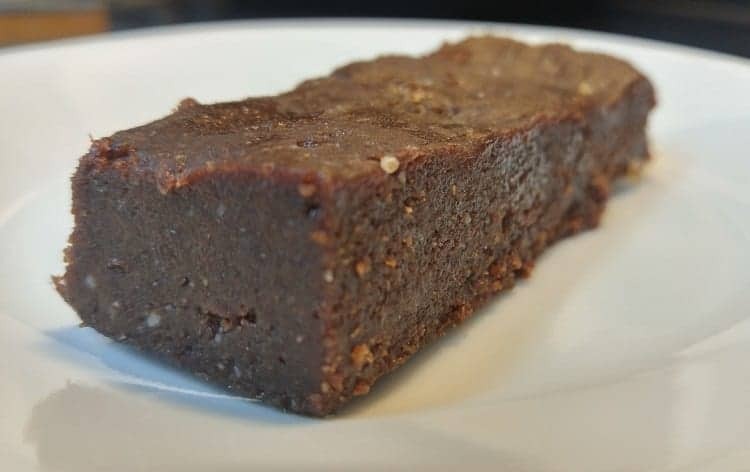 Just one of these Low Carb (Keto) Protein Bars is an excellent source of protein (25.6 g protein – including 2 g of the essential amino acid leucine which is important in preserving and building muscle mass), is an excellent source of fiber (9 g), and is high in iron (3 mg) and calcium (212 mg). They also have 2.7 g of Omega 3 fatty acids each. Mix all dry ingredients for the bottom layer together. Melt the coconut oil over a low heat, until just barely melted. Put the peanut butter in a deep bowl and slowly stir in the melted coconut oil. Gradually stir in the water, stirring very well until completely blended and smooth, then add the vanilla extract. Pour the peanut butter, coconut oil and water mixture into the dry ingredients and mix well with a large spoon, until it forms a dough. Gather the ball together with your hands, and knead as you would for a bread dough, to make sure all the dry ingredients are uniformly moist. Grease a 7 ½ x 11-inch baking pan and gently press the dough into pan. You can wet your hands with a little bit of water to make the process easier. Take a small, empty glass jar (or drinking glass) and use it like a rolling pin, to make the bottom layer (the chocolate one) flat. 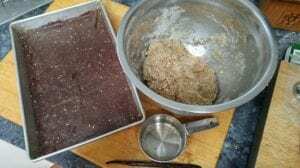 Repeat the same procedure to make the top layer, except substitute tahini (sesame butter) for the peanut butter, omit the cocoa powder and increase the whey isolate powder by 3 Tbsp. (13 Tbsp instead of 10). 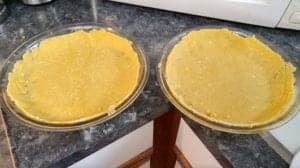 Gently place the top layer mixture over the pressed bottom layer, then use hands that are dampened with a bit of water, to press the top layer flat. You can use the glass jar or glass drinking glass as a rolling pin, to make sure the top is uniformly flat. Feel free to drop me a note through the “Contact Me” form should you have any questions or want additional information. 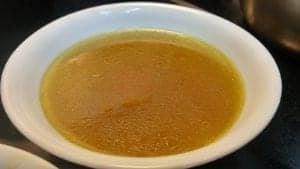 To those who are new to a Low Carb High Fat or Ketogenic lifestyle, “bone broth” may be something new. At first glance it may seem like a stock, but it is very different. 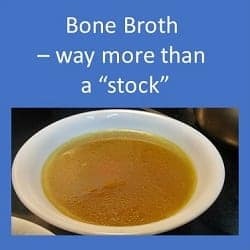 A stock is made with meat and is cooked for ~ 2 hours, whereas bone broth is made with animal bones (beef or chicken, usually) and only whatever meat clings to it and is simmered for 18 hours or more. Bone broth is the beverage of choice for many when they are intermittent fasting (also called ‘time restricted eating’) – more on that here. Intermittent fasting is really a misnomer as a “fast” involves a period of time without nutrition, a temporary form of starvation. During therapeutic intermittent fasting, bone broth is often taken as it provides a good rich of protein and electrolytes, so the body is not put in starvation mode (which slows metabolism). Drinking bone broth while intermittent fasting would be similar to following a ‘protein-sparing modified fast’. 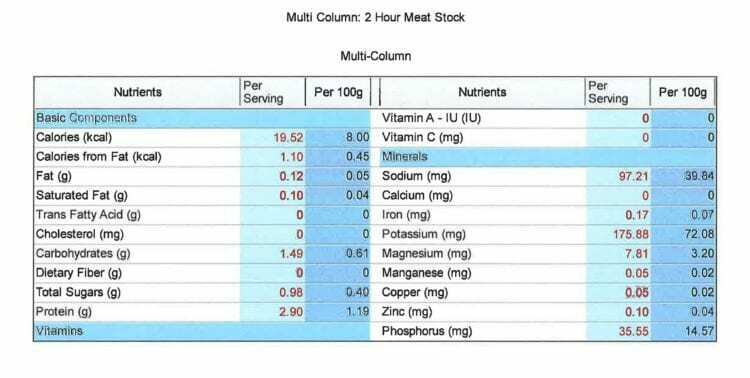 Below is the nutrient comparison done by a professional food lab, showing the difference between an ’18 hour bone broth’ and a ‘2 hour meat stock’. As you can see, the 18-hour bone broth has more than 3 times the amount of protein – almost 10 g of protein per 1 cup (244 g) serving. The 2 hour meat stock pales in comparison. 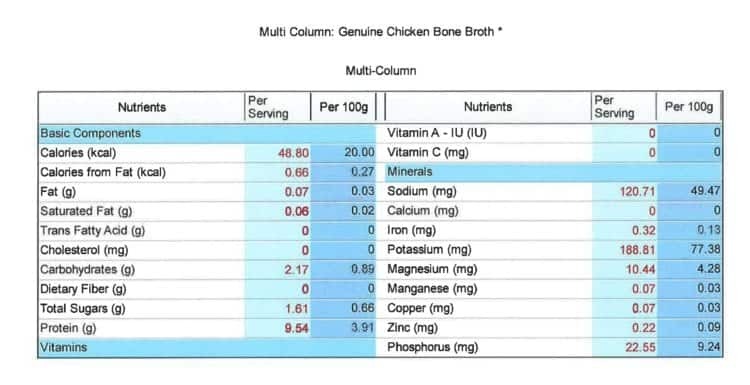 In addition to the significant difference in nutrients, there is a fundamental difference in a meat stock compared to bone broth and that is gelatin. 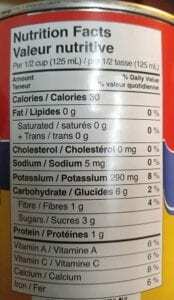 I’m not talking about the flavoured, coloured stuff that our mothers or grandmothers fed us for dessert, but the protein that is extracted by simmering animal bones, cartilage and other connective tissue to extract the collagen, the protein that connects muscle and cartilage to bone in animals. 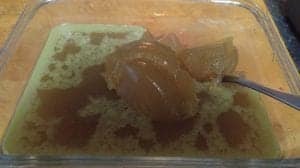 When bone broth is simmered for 18 hours or more, collagen breaks down and is transformed to the flavourless, colorless substance called gelatin. That is why after bone broth cools, it has a jelly-like texture. Gelatin also contains the amino acids glycine, proline, lysine, alanine, arginine and valine which is an essential amino acid that cannot be produced by the human body, which means it must come from the diet. 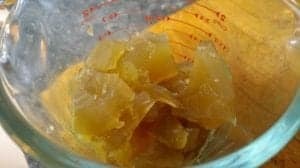 In addition to giving bone broth it’s characteristic body, there are some clinical studies that seem to indicate that gelatin may reduce pain and improve joint mobility in those with osteoarthritis. Making bone broth is less about a recipe and more about a method. It takes the right ingredients and lots and lots of time. 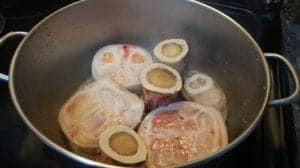 1 – When I make beef bone broth, I used both beef marrow and beef foot bones. The marrow bones are round with the marrow in the centre and the beef foot bones have lots of cartilage, which helps form the gelatin. 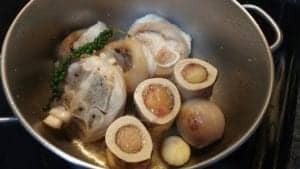 2 – I brown the marrow and foot bones on both sides in a little coconut oil and add a small onion for flavour, some fresh or dry peppercorns and sea salt, then cover with cold, filtered water. The reason I use cold water, is to enable me to skim off the “foam” which is produced as the bone broth begins to simmer. 3 – The most important “ingredient” in making bone broth is time; at least 18 hours at a low, slow heat. It shouldn’t boil, but be held just below the boiling point the entire time. A slow-cooker works well for those who work or study outside of home. 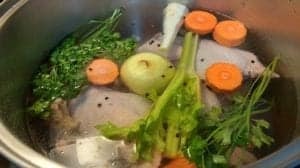 Like a beef bone broth, a chicken bone broth is about a few essential ingredients and lots and lots of time. 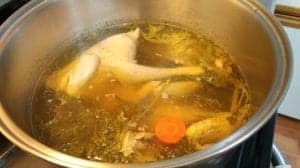 A stewing hen is essential for making chicken bone broth because it is mostly bone and connective tissue with almost no “meat” on it. On a whole hen, there is maybe 1 cup of meat. 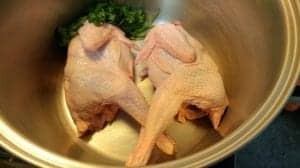 These fowl are usually birds that have outlived their usefulness for laying eggs and it’s the age of the chicken and all it’s connective tissue that makes it perfect for making bone broth (or soup). The other essential ingredient is the addition of chicken feet. Yes, chicken feet. Like the beef feet in beef bone broth, the chicken feet have lots of connective tissue which results in the production of gelatin. I chop the nails off of them before making bone broth but many butchers that sell them will do this for you, if you ask. 1 – Put two or three stewing hens at the bottom of a large stock pot. 3 – Skim off the foam with a small mesh designed for this purpose until it stops producing foam. 4 -Lower the heat to medium low and simmer soup for at least 8-10 hours, overnight if possible. Be careful not to boil. Want to know more about how I could help you reach your health and nutrition goals following a low carb or ketogenic lifestyle? Please feel free to have a look around my website and send me a note with your questions using the “Contact Me” tab above. You can also download a complete summary of my services here. 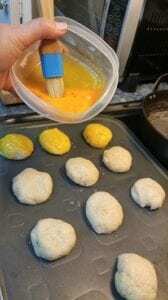 As mentioned in an earlier post, sometimes my recipes are developed out of my own need for a low carb product, and sometimes are initiated at a client’s request. 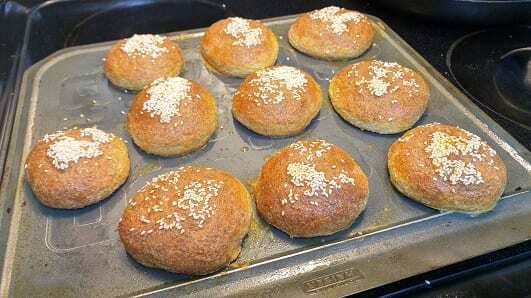 The creation of a larger-size Kaiser bun which could also be used as a hamburger bun came at the request of someone that follows me on Facebook, and is a modification of the recipe I posted yesterday for Keto Yeast Rolls . This recipe produces an ever-so-slightly denser bun that will hold up to even the juiciest burgers and wettest sandwich toppings. They have a wonderful authentic bread-like texture and the yeasty smell when baking makes the process of making them just delightful. 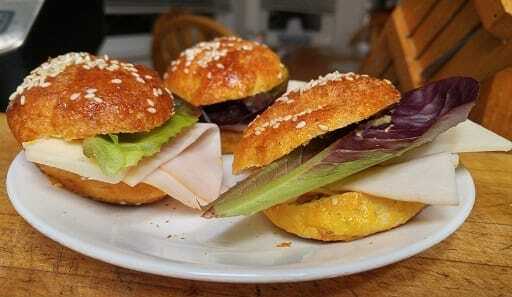 Low Carb Kaiser bun sandwich – with smoked chicken, Emmenthal cheese, red butter lettuce and just a hint of Dijon mustard. 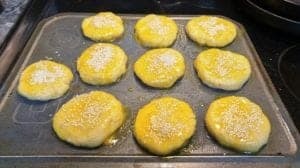 There is no “eggie” taste to these because they’re made with egg white and only painted with the yolks as a wash and unlike most keto bread fare, there is no cheese in this recipe so they are suitable for those that can’t tolerate dairy. While instant yeast doesn’t require “proofing” (activation in water), it is dissolved in lukewarm water before being added to the dry ingredients in this recipe in order to impart their hallmark yeast-taste but the bulk of the leavening action comes from the beaten egg white and vinegar. 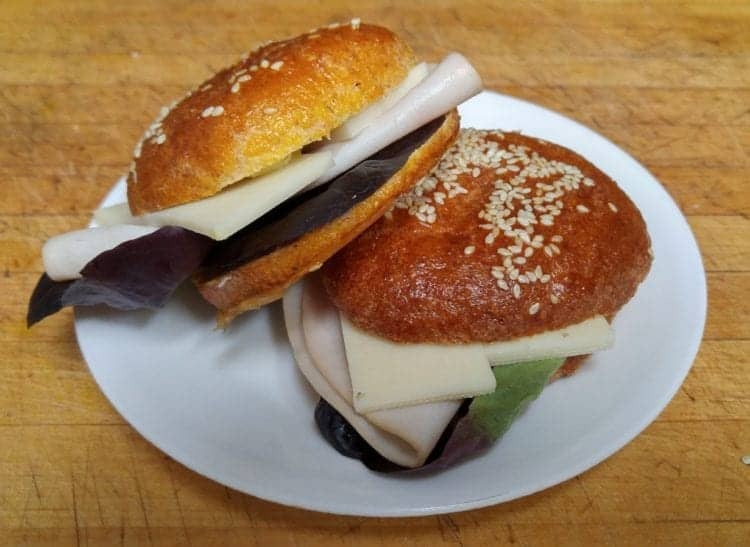 These buns make lunchtime a breeze because delicious, authentic sandwiches are possible and at only 10 g net carbs and almost 10 g of protein each, these rolls can fit into most a Meal Plans. Below is the recipe with some pictures of the process. 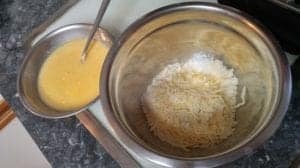 1 – In a medium sized mixing bowl, place the almond flour, psyllium husk, baking powder and salt. 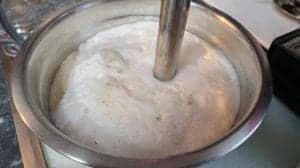 2– Dissolve the instant yeast and few grains of sugar in the 1/2 cup of lukewarm water, and allow it to proof. It will get foamy, which is what you want. (Note: The yeast feed on the sugar so it doesn’t add carbs to the rolls but feel free to leave it out if you can’t have it for whatever reason). 3– Separate the eggs whites and egg yolks into two bowls: the egg whites in a medium size bowl so they can be beaten, and the yolks in a small bowl to use as an egg wash for the rolls. 4– Beat the egg whites until soft peaks, then beat in the apple cider vinegar. Set aside. 5– Preheat the oven to 350°F, with the baking rack in the middle. 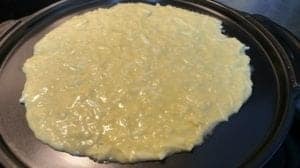 6-Pour the dissolved yeast mixture into the dry mixture, and gently fold in the beaten egg whites and the 3/4 cup of water. 7 – Beat the mixture with a stick blender until it comes together as a dough. 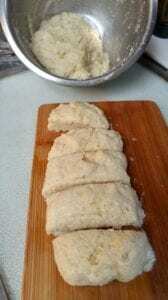 8 – Divide the soft ball of dough in half and roll each piece into a log and cut into 5 equal pieces. Each ball should be the same size so that the buns bake uniformly. 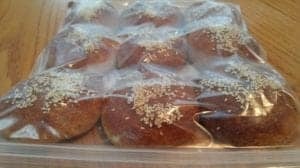 9 – Wet hands with water and roll each bun into a ball and then press into a three inch flat disk and place it on a lightly greased baking sheet. 10 – Brush each roll with the egg yolk wash.
11– Sprinkle with sesame seeds. 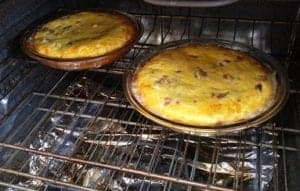 12 – Bake at 350°F for 50 minutes then turn off the oven and leave them in for 20 minutes without opening the oven door. This is an important step to ensure the inside has that real bread-like texture. 12 – Cool on a wire rack for 10 minutes and either use or pack into a large heavy weight zippered bag, remove the air with a straw, and refrigerate or freeze for later use. If you have questions about the local or long distance low carb and keto services that I provide, please visit the “Services” tab located above and feel free to drop me a note through the “Contact Me” form should you want additional information. 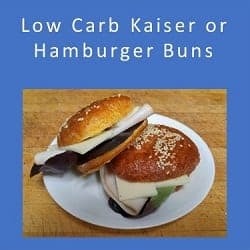 NOTE (February 27 2019): This Low Carb Kaiser Bun recipe makes 12 Kaisers, the size of hamburger buns. Over 3000 people have downloaded or printed it and to date I’ve only a handful of people who have had difficulties. 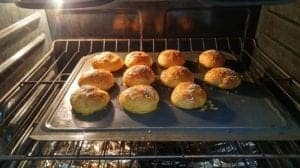 If you run into a problem making these, please check that you included the correct ingredients in the quantity indicated, have followed the same preparation method listed here, that your yeast and baking powder are fresh and that your oven’s baking temperature was recently calibrated. I’m sorry, but outside of this advice I really can’t help with troubleshooting any baking challenges. There’s nothing like the smell of yeast bread baking — and the taste of hot dinner rolls straight from the oven defies description. Whether you slather them with fresh creamery butter or pile them high with cold meat or cheese, these dinner rolls are sure to please. They have a wonderfully crisp exterior and are easily slice in half, revealing their tender, moist bread-like texture. These are real rolls! 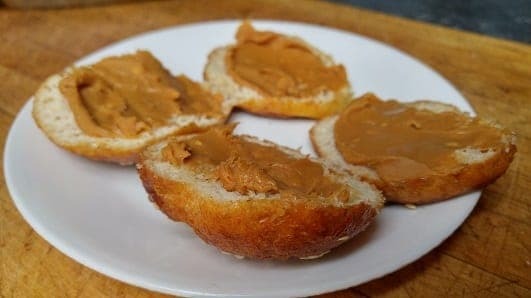 There’s no “eggie” taste because they’re made with egg whites and there’s no cheese of any kind, so the rolls can be eaten “as is”, topped with nut butter to have with coffee for breakfast or piled high with smoked chicken and Swiss cheese and eaten with a salad as a light meal. These are only 5 g net carbs and almost 5 g of protein each, so these little rolls pack a nutritious punch. 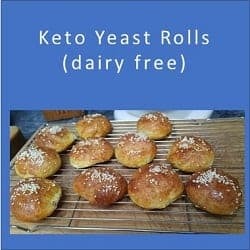 What makes these dinner rolls very different from the standard keto fare is the smell and taste and texture of a ‘bread’ baked with yeast (although the bulk of the leavening action comes from the beaten egg white and baking powder). If you have questions about the remote and in-person services that I provide, please drop me a note through the “Contact Me” form located on the tab, above. 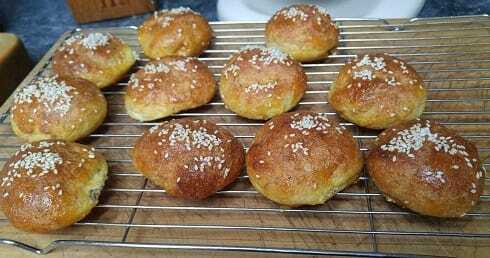 NOTE (February 27 2019): This Keto Yeast Roll recipe makes 12 small dinner rolls. 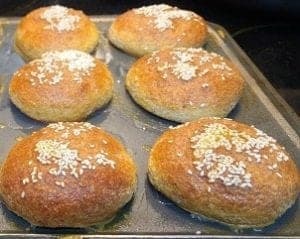 If you want larger rolls for sandwiches or hamburger buns, please look just below for the link to that recipe. Since posting this recipe, I’ve had almost 25,000 people download or print it and to date I’ve only a handful of people who have had difficulties. 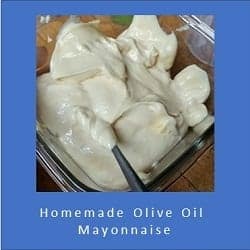 If you run into a problem making this, I would recommend checking that you included the correct ingredients in the quantity indicated, have followed the same preparation method listed here, that your yeast and baking powder are fresh and that your oven’s baking temperature was recently calibrated. I’m sorry, but outside of this advice I really can’t help with trouble-shooting challenges. *someone that follows me on Facebook requested that I post a recipe for a larger-size Kaiser bun which could also be used as a hamburger bun. That recipe, which is a modification of this one is posted here. 1 – In a medium sized mixing bowl, place the almond flour, psyllium husk, salt and baking powder. 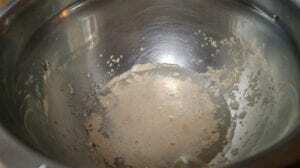 2- Dissolve the instant yeast and few grains of sugar in the 1/4 cup of lukewarm water, and allow it to proof. It will get foamy, which is what you want. The yeast feed on the sugar, so don’t omit it. 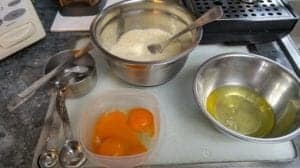 3- Separate the eggs whites and egg yolks into two bowls: the egg whites in a medium size bowl so they can be beaten, and the yolks in a small bowl to use as an egg wash for the rolls. 4- Beat the egg whites until soft peaks, then beat in the apple cider vinegar. Set aside. 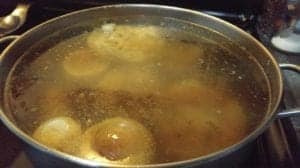 6-Pour the dissolved yeast mixture into the dry mixture, and gently fold in the beaten egg whites and the 3/4 cup of lukewarm water. 8 – Divide the soft ball of dough roughly in half and cut each piece into 5, or one into 5 and the other into 6. The important thing is each ball should be the same size. 11 – Bake at 350°F for 50 minutes then turn off the oven and leave them in an extra 7-8 minutes. 12 – Cool on a wire rack for 10 minutes and then enjoy! 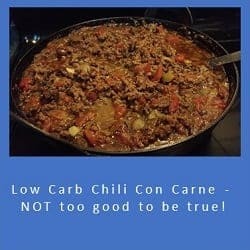 What if I told you that it is possible to enjoy real Chili Con Carne on a low carb high fat plan? Would you be interested? This Chili is rich with ancho chili peppers, diced onion and green pepper, with plenty of fresh minced garlic. Along with a hint of ground cumin, a healthy dash of oregano and salt, these classic chili seasonings are simmered gently with browned, medium ground beef, canned diced tomatoes and beans…real beans! 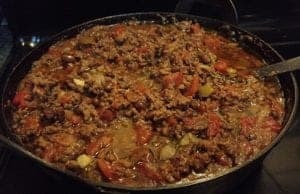 Low Carb Chili – with real beans! Beans? 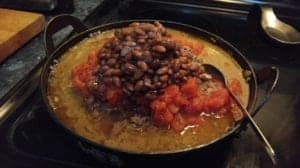 How can it be low carb with beans??! Ahhh, that’s because these beans are black soy beans. Yes, they’re a thing! Black Soy Beans are soybeans that have a black seed coat on the outside of the bean. Inside, they are the same colour as regular yellow soybeans, although they are smaller than yellow soybeans. Though they look quite a bit like Black Turtle Beans, don’t mix the two up, because Black Turtle Beans are high in carbs, as are all legumes and pulses (another word for “beans”). Black Soy Beans are so low in carbs and so high in fiber, that they have a mere 1 gm of carbohydrate for a 1/2 cup serving – and there is only one can of these beauties in the entire pot of chili. 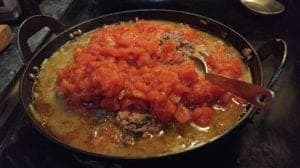 Canned tomatoes are fairly low in carbohydrate too, and there was only one 796 mL (28 oz) can of those in the entire recipe. The rest was veggies, meat and seasoning. 1 – In a heavy dutch oven or cast iron casserole, melt the coconut oil over a medium-high heat. 3 – Add the diced green pepper and saute until wilted. 4 – Add the ancho chili pepper and gently saute until all the vegetables are soft and well coated with the pepper, then add the salt, cumin and oregano. 5- Sprinkle the freshly minced garlic on the top and continue sauteing gently until it begins to become translucent. 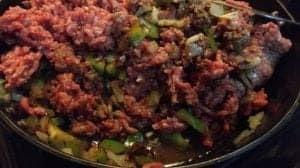 6 – Gently crumble the ground beef on top of the cooked, seasoned vegetables and continue to saute over a medium high heat until the beef begins to brown. 7 – Empty the can of diced tomatoes on top. 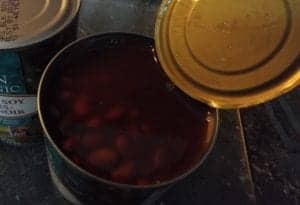 7 – Then empty the can of black soy beans with the liquid, on top of the tomatoes. 8 – Gently stir until well mixed, then simmer over a low heat for at least an hour (preferably until the liquid is thick and flavourful. Chili con Carne – ready to serve! 9 – Serve the chili in individual soup bowls, topped with your favourite chili toppings. Some popular ones are diced avocado, minced green onions, shredded mozzarella and a dollop of sour cream. Top with Mexican habanero sauce if desired and enjoy! One of the important services I provide to my clients are day-to-day meal ideas and recipes, as well as information on how to thrive living low carb in a high carb world. After all, for any lifestyle to last it needs to be sustainable – enabling people to eat real food prepared in ways they enjoy. Over the last several years, I have created dozens of satisfying low carb and ketogenic adaptations for well-loved recipes, only a few of which have found their way onto this web page. 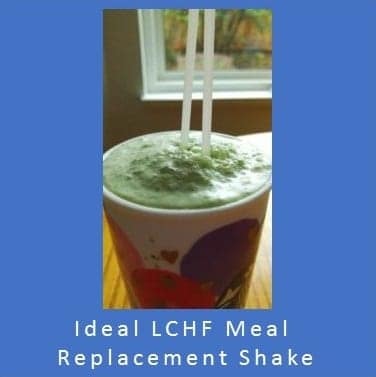 For the most part, my recipes come out of my own need following a low carb high fat / keto lifestyle, but some ideas have been generated by my client’s needs; such as the Ideal Low Carb Meal Replacement Shake that I posted yesterday. 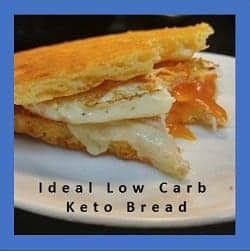 One of the things my clients who follow a high fat moderate protein lifestyle needed was a low carb high fat keto bread that could be eaten “as is” with melted butter, made into a grilled cheese sandwich, or an egg and sausage breakfast sandwich, and which would hold up to being loaded with meats and cheese, slathered with mayo and eaten without falling apart. Storing and freezing the bread for later use was also essential. That recipe is below, along with the nutritional info per slice and macronutrient distribution. 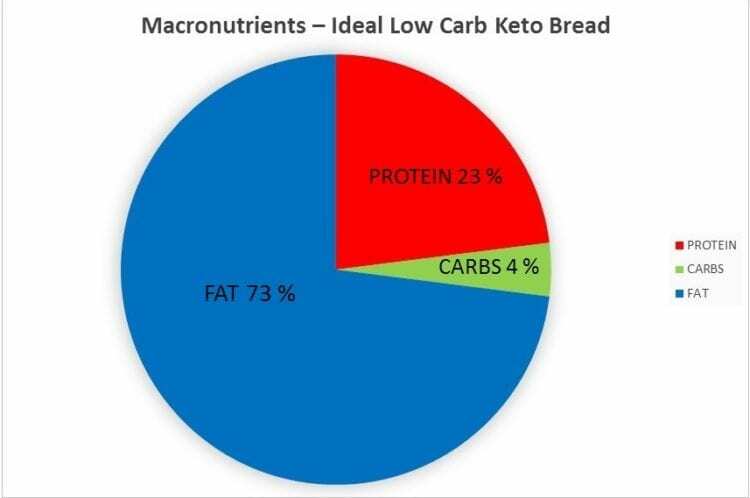 What makes this bread “ideal” for those following a low carb moderate protein lifestyle because (1) that 2 slices can serve as a meal replacement on it’s own or with a salad, it is (2) low carb and high in healthy fat and (3) 2 slices have the equivalent protein found in an average meal on either a moderately low carb or ketogenic (keto) low carb diet. The ingredients are (4) available at any large chain supermarket and will (5) keep you from feeling hungry for a long time due to the type of protein and amount of fat it contains and (6) is quick to prepare. 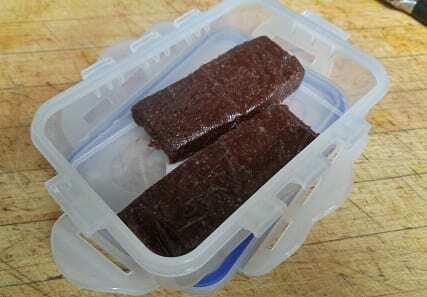 It (7) stores well in the fridge and (8) can be frozen for quick use later. 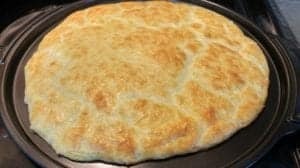 This bread is light and moist with a lovely, tender crust and can be topped with hot or cold meats or cheese and will hold up to lettuce, tomatoes and mayo, too. It’s uses are as limitless as your imagination. 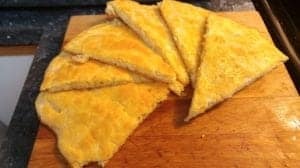 The recipe and instructions for making this bread are below as well as a few photos of serving uses. 1 – Preheat the oven to 375 °F (190 °C). 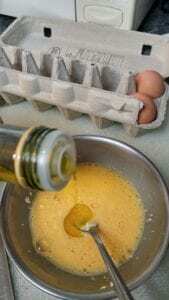 2 – In a small bowl, beat the egg and egg yolk and add the softened cream cheese. 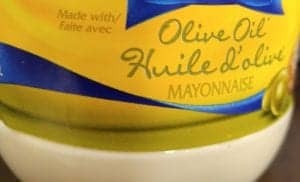 3 – Drizzle in the olive oil as if making a salad dressing (so it is suspended in the egg / cream cheese mixture). 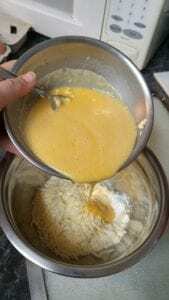 4 – Combine the dry ingredients in a medium size mixing bowl. NOTE: The two bowls with wet and dry ingredients can be covered and refrigerated at this point and be combined and baked within minutes the following morning, for breakfast sandwiches or lunches. 5 – Pour the liquid ingredients into the dry ones. Note: The dough will a thick batter. 6 – Using a non-stick pizza pan sprayed with cooking spray (or a regular baking sheet lined with parchment paper), pour the dough in the middle. 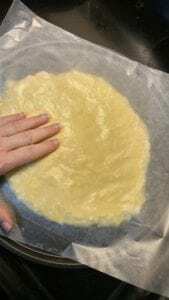 7 – Place a piece of wax paper or parchment paper on top of the dough and gently press outward with your fingers until you have a 10″ circle. When you remove the wax (or parchment paper), scrape any batter sticking to it onto the dough. 8 – Bake the crust for 9-10 minutes or until golden brown. Be careful not to over bake it or it will be too dry and crumbly. 9 – Remove the crust from the oven and let cool a few minutes before transferring to a board and cutting. 10 – Cut the bread in eight wedges. 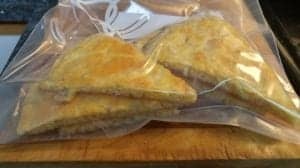 The individual slices of bread can be placed in a freezer-weight zipper storage bag and placed in the fridge for the following day or frozen for later use. This bread is delicious hot from the oven, slathered with butter. Mixing up the wet and dry ingredients the night before, and storing the bowls in the refrigerator overnight makes it possible to prepare hot bread in the morning in less than 15 minutes, including clean up. 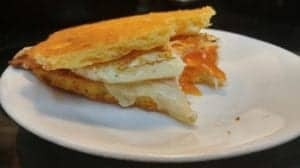 A “croque monsieur” is a baked or fried ham and cheese sandwich. My version is made with smoked chicken. I photographed this one before topping it with the second slice of bread, so you can see how well it holds up to grilling. 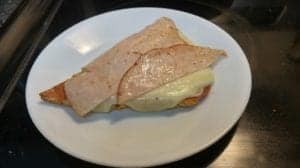 Topped with cheese, smoked ham (or smoked chicken) and a fresh easy-over egg makes this the most amazingly delicious egg and sausage sandwich imaginable! 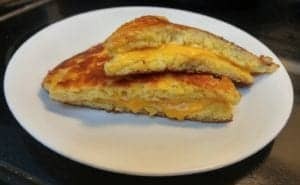 Who doesn’t love grilled cheese? This one has all the taste and ‘mouth-feel’ of a high carb version, without the carbs! One of the services that I provide my clients are meal planning ideas and recipes – only a few of which end up on this web page. One of the meals that people find the most challenging is breakfast, for several reasons. First of all, many have been used to eating cereal or toast in the morning and now that they’re following a low carb / keto lifestyle they are at a little bit of a loss for what to eat. The other challenge that many have in the morning is a lack of time. They’re busy and sometimes don’t have the time to cook, but still need to eat! These are essentially protein powder with flavouring and thickening agents. 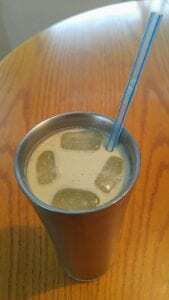 For those following a low carb high fat ketogenic style of eating, this smoothie is very easy, healthy, and that can be used “as is” or as the basis for a whole host of other low-carb shakes as limitless as your imagination. 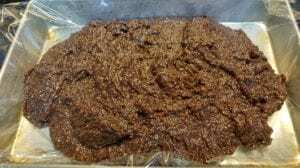 It contains no flavour, colour, preservatives or thickeners and costs almost half ($2.50 per serving) of what a commercially available packet would cost. 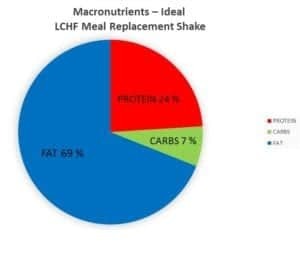 What makes this shake “ideal” as a meal replacement for whose lifestyle is low carb high fat is that it (1) has the equivalent protein found in an average meal on either a moderately low carb or low carb high fat diet. 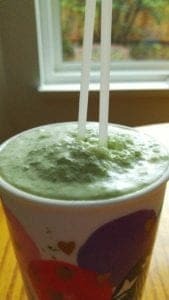 The ingredients are (2) available at most large chain supermarkets and the shake (3) requires no special equipment to make. It has ingredients that are (4) documented to help promote weight and abdominal fat loss* and that will (5) keep you from feeling hungry for a long time due to the type of protein and amount of fat it contains, and is (6) high in antioxidants. Best of all, (7) it can be made in minutes! The ingredients are available at most large supermarkets and it really doesn’t matter which brand of matcha, ‘daily greens’ mixture or whey protein you buy, but I’ve mentioned a few things that I look for when purchasing these ingredients, to help guide you. There are many different brands of matcha available (the best ones come from Japan and Taiwan) and almost all large food chains produce their own brand and/or sell a variety brands of ‘daily green’ mixtures and whey protein isolate. I recommend that you read the labels to be sure they don’t contain any added sugar or sugar alcohols (erythritol, xylitol, etc.) as these will add needless carbs. 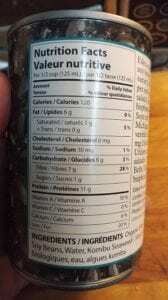 These products are usually stocked with either ‘natural foods’ or in the pharmacy section of the store. I always buy whatever brand of boxed coconut milk is available as it does not require preservatives (canned ones do). Any brand from Thailand, Indonesia or Malaysia that is pure coconut milk and not thickened with carrageenan, guar gum or xanthan gum is good. I usually have 10 boxes of 250 ml and 500 ml pure coconut milk on hand so I can make these shakes or my ‘matcha smoothie recipe‘ (which is great on intermittent fast days as an alternative to ‘bone broth”as there is almost no protein or carbs in it). …or if you have a few extra minutes and a blender, it can be whirred with a little extra ice to make a wonderful meal replacement smoothie. Place the green tea (matcha) powder and ‘daily greens’ mixture in a small stainless steel sieve and gently rub through the sieve into a small ceramic bowl, using the back of a spoon. 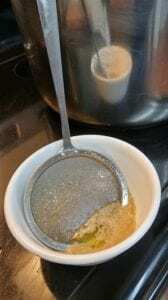 Discard any residue from the sieve. Add the unflavoured whey protein isolate to the ceramic bowl. Using a whisk (or if you have one, a bamboo whisk available at Japanese and Korean grocery stores) add 3 Tbsp boiled water, while stirring with the whisk. 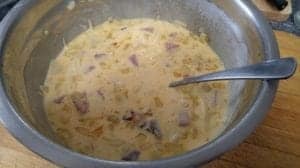 Keep stirring briskly until all the lumps are gone and the mixture is smooth. Stir in the coconut milk, blending well. Pour mixture into a tall, insulated 2-3 cup (500-750 ml) travel tumbler, add ice cold water and ice cubes and enjoy! 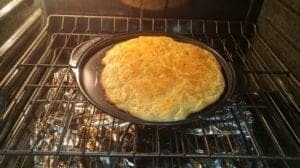 I tried a few existing recipes for low carb pizza and was quite disappointed, as they were either more like omelettes, or gritty with coconut or almond flour. The biggest strike against them was that they were limp – definitely not the crisp, yeasty finger food I was wanting! I decided to invent one. I knew basically what ingredients I wanted to use (based loosely on my tempura batter) and that it had to have a yeasty ‘bread’ taste. I also knew it would have some cheese in the crust (like the infamous ‘fat head pizza’) and that it had to be so overwhelmingly ‘legit’ that someone who wasn’t eating low carb or keto would enjoy it. Finally, it had to be good cold, too – after all, who doesn’t like cold pizza? To my delight, I practically nailed it on the first try. If you’re like me and love pizza, I hope you will enjoy this one. In a smaller bowl, beat the egg and egg yolk and add the softened cream cheese. Drizzle in the olive oil as if making a salad dressing (so it is suspended in the egg / cream cheese mixture. Once the yeast has proofed (foamed), mix it into the liquid. Stir well. Pour the liquid ingredients into the dry ones. 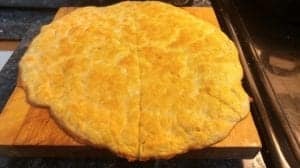 Using a non-stick pizza pan (or a regular baking sheet lined with parchment paper), use the back of a spoon to smooth the dough into a 10-inch circle. Place a piece of wax paper or parchment paper on top and gently roll with a rolling pin. When you remove the wax (or parchment paper), scrape any batter sticking to it onto the dough. Bake the crust for 10 minutes or until golden brown. Don’t overcook. Remove the crust from the oven and top with your favourite pizza sauce and toppings. Once the pizza is topped, return it to the oven to bake until the cheese is melted and it is just beginning to brown. Allow to cool a few minutes, then slide the crispy pizza to a serving board, cut, serve and enjoy! What would the holidays be without eggnog? I’m not talking about the artificially yellow-coloured, carrageenan-thickened beverage from the supermarket, but real eggnog rich with egg yolks and heavy cream. That’s what I’m taking about! Whether its for Christmas Eve or New Years, eggnog embodies the holidays. According to Statistics Canada, during the 2014 holiday season, Canadians drank ~5.3 million litres of commercially made ‘eggnog’, but apparently a decade ago, it was closer to 8 million litres! Perhaps the mistaken belief that saturated fat is ‘bad’ for us has led to the decline, or maybe it is simply that the commercial-prepared substitute pales in comparison to real eggnog. Real eggnog is made from lots of egg yolks and cream – heavy cream and light cream. It is delicately flavoured with freshly grated nutmeg and some also add a hint of real vanilla extract (made from vanilla beans, soaked in vodka) and yes, it is often served liberally mixed with rum. 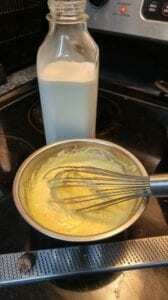 In days gone by, eggnog was made from raw egg yolks, but my recipe cooks the egg yolks over a double boiler then holds them at a high enough heat to make them safe. It is lightly sweetened and then blended with cream and spices and placed in a glass milk bottle, until well chilled. Yes, it is enjoyed with real rum (carb free). 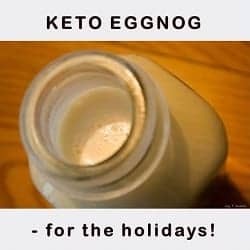 Here is my recipe for eggnog – just in time for the holidays! In the top of a double boiler (not over hot water), whisk the egg yolks, heavy cream and erythritol sweetener to blend well. Bring water in the bottom of the double boiler to a gentle boil and place the top part, with the eggs on top. From this point on, whisk constantly without stopping (otherwise you will have scrambled eggs). 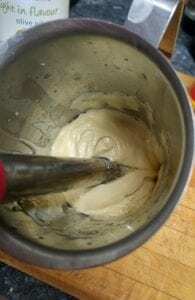 Whisk vigorously and constantly until the mixture is thickened and keep whisking until an instant-read thermometer inserted into the mixture reads 140°F for 3 minutes or longer.The mixture should be thick enough to completely coat the back of a spoon. 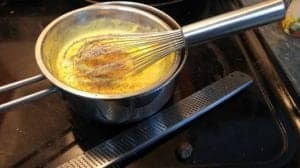 Remove the top part of the double boiler and keep whisking the mixture a little while longer, as it begins to cool down. Add the freshly grated nutmeg (and splash of real vanilla, if using) and whisk another 2 minutes or so, as the mixture continues to cool. 6. 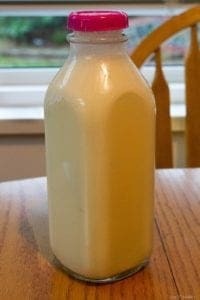 When the mixture has reached room temperature, gently whisk in the coffee cream and place in a glass milk bottle or glass pitcher with a tight fitting cover, so the eggnog doesn’t absorb the smells of other foods in the fridge.Allow the eggnog to chill thoroughly before serving (with or without rum).